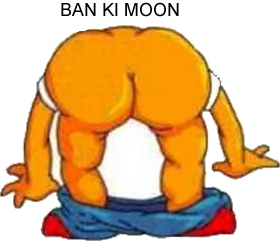 Ban-ki Moon is mooning the Burmese people. The Seoul Times, Online newspaper from South Korea, posted the transcript of CNN's interview with Ban-ki Moon. The Smiley face,Mr Moon, closed his answer to the last question of the interviewer from CNN; "That's why I have to discuss with Myanmar leadership when I meet them.I'm going to make it happen as soon as possible." Yes, We understand Mr Moon and his schedule. As the only and one Secretary-General of United Nations: the most busiest organization on this planet, he has great responsibility to promote a bunch of Korean drama movies,in spite of having alot of customers waiting in line for his very own authentic Korean Kimchi. Meanwhile incredibly busiest officialdoms from UN are browsing Ebay, facebook , myspace , sushi , Sak's fifth avenue and several other sites online,Mr Moon also has solid reason to delay to meet with vicious and cunning Junta, it never was the official government of Burma,because Mr Moon is busy mooning the Burmese people now. If he humbly requests Burmese Junta to meet with him, they will readily insert their bananas and Mr Moon is not so ready to take them all in yet.Which is why, international community and the people of Burma must be patience and understand his situation.